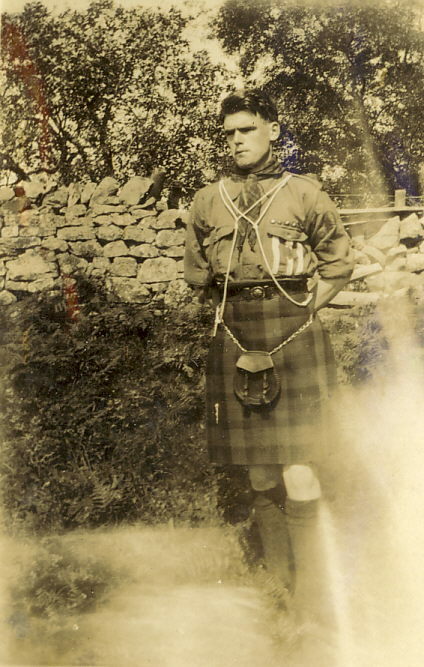 Monochrome photograph of scout Troop Leader (three white stripes on shirt pocket) standing in front of a stone wall in full dress uniform less headdress. Probably taken at scout camp during the years 1928-1934 at Dunrobin Camp Golspie in July 1929, Overskibo, Beauly, or Dunrobin Park. From a set of photographs glued to 10 sheets of brown paper with some spaces where photos have been torn out.